Success stories that involve parlaying a vocational certificate into middle-class security need more attention. The flow of students into colleges has slowed — between 2011 and 2017, undergraduate and graduate student enrollment in degree-granting institutions fell by 1.7 million students, or about 9 percent. But both the perceived and real value of a bachelor’s degree as a pass-through to high-paying professional success seems unlikely to diminish in the foreseeable future. A continued emphasis on post-secondary degrees and white- and gold-collar jobs puts even more pressure on educators and employers to answer the unmet demand for middle-skills workers. So, advocates say, students must be exposed to these less-considered but greatly needed careers — and they must be taught that earning a four-year degree is not the only path to success. It may be easy to forget that college as a prerequisite is part of a fairly recent paradigm shift. In the 1970s, before computers began to radically reshape the economy, just 20 percent of jobs in America required education or training beyond high school. Today, that figure stands at more than 60 percent. 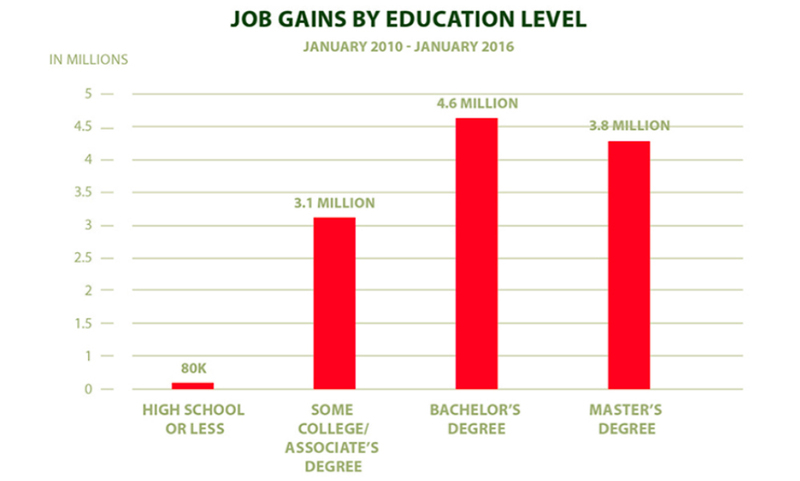 Since the Great Recession, 11.5 million of 11.6 million new jobs demanded postsecondary academics or training. In calculating the value of a four-year degree, the Federal Reserve Bank of New York found that from 1970 to 2013, degree holders earned 56 percent more than those who had only a high school diploma. To better ready students for college-level work, school systems have implemented higher standards, instruction that requires deeper student engagement, and harder tests. But groups that help students transition to postgraduate life say a conveyor-belt preparation model has contributed to students enrolling in college unprepared or uninterested, which has resulted in large gaps in completion rates between high- and low-income students, crippling student loan debt, and wide inequities by race and income on markers like employment and incarceration. In collaboration with educators and business leaders, advocates are creating programs across the country that expose students during the school day or after school to middle-skills professions. Ranging widely across sectors like health care and information technology, law enforcement and the trades, about half the country’s jobs fall into this category. But elevating middle-skills work was not among the reform priorities of No Child Left Behind, nor its K-12 successor, the Every Student Succeeds Act, during the respective Bush and Obama administrations. The benefits of college can overshadow its risks. Enrollment has risen by about 50 percent since the 1980s (slowing after 2010), but only about one-third of Americans have four-year degrees. Completion is correlated with income: the Pell Institute, which reports on inequality in higher education, found that 58 percent of students from families in the top quartile of income earned bachelor’s by the age of 24, while the same was true for just 11 percent from the lowest-earning quartile. Low success rates among less affluent students along with rising costs, declining wealth accumulation for graduates, and the lack of good job and wage prospects for many majors all fueled the move to diversify students’ post-high school options. “The return on investment for a bachelor’s and advanced degree is very high, much higher than the stock market or real estate,” said Jeff Strohl, director of research at the Center on Education and the Workforce. Career and technical education in high school and community college has increasingly targeted middle-skills occupations, which may require more training and where employers have not been able to fill shortages — particularly in growing fields like health care and cybersecurity. Missy Sparks, an executive with Ochsner Health System, one of Louisiana’s largest employers, says working with YouthForce NOLA gives the company the chance to break through students’ assumptions about the kinds of jobs they can get. YouthForce NOLA sponsors year-round and summerlong internships at Ochsner that allow students to experience as much of the “health environment” as possible, Sparks said. They watch operations, learn to make sutures, and attend presentations where professionals describe the education and responsibilities their jobs require. The smorgasbord approach makes sense to Shaun Dougherty, a professor at Vanderbilt University who believes vocational programs should avoid narrowing options for students too early. 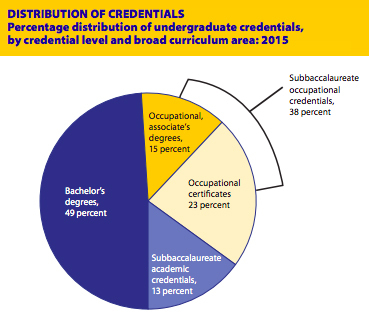 Even before college enrollment began to dip, educational and career pathways that culminated in certificates and associate’s degrees grew more quickly than four-year degrees between 2004-05 and 2014-15. 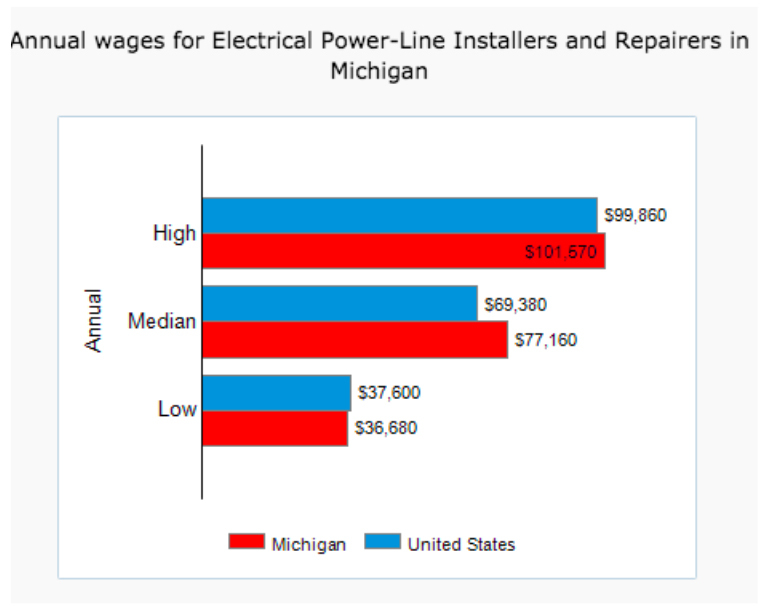 The electrical line worker program in Michigan, supported by the U.S. Chamber of Commerce and Consumers Energy in response to the company’s shortage of qualified workers, targeted areas where the power company had been successful in recruiting workers in the past. Students who excelled in the community college program pipelined into the power company to begin an apprenticeship. The arrangement yielded 124 new line workers over two and a half years who could look forward to a steep return upon completing their training, according to one of the initiative’s architects. “They start at $28 an hour and move up rapidly,” said Sharon Miller, who oversees workforce issues for Consumers Energy, describing an income annualized at around $50,000. “I believe most are at $40 to $45 an hour. But overtime is prevalent, and that’s how they can get to six figures.” Miller said line workers retire in their mid- to late-50s. The line workers face a somewhat lower ceiling on future earnings than college graduates with lucrative majors. The job is also relatively dangerous, with about the same incidence of fatalities as police officers, but wages compare favorably with those of most graduates of four-year colleges. Despite an availability of middle-skills jobs in many occupations, challenges persist. Employers and others have attributed shortages in some occupations to a “skills gap” arising from insufficient training, particularly where advances in automation have changed job requirements. CTE and other occupational programs have targeted these areas, though economists are divided over whether it actually exists, or they describe it differently. Sparks, the Ochsner executive, suggests the problem is more fundamental. Swinburn says that some families say they’re grateful to YouthForce NOLA for bringing career development back into school, but “the other half said, ‘I get what you’re saying, but my kids’ classroom has been named after someone who went to college and you’re saying they’re not going to college anymore,’” she said. ← Project-Based Learning is Closing the Gap Between Schools and the Real World.